With direct access to Alvor beach and just a few minutes walk from the delightful fishing harbour of Alvor, the Dom Joao will suit golfing groups and couples alike who prefer a traditional yet lively location. Great value golf packages with a choice of 5 Pestana courses. Centrally located in Vilamoura, the ever popular Dom Pedro Vilamoura Resort Hotel provides a great value base, with good year round offers for golf groups, couples and families alike. The hotel now also offers an 'All Inclusive' option. Our most popular 4 star hotel in the Lisbon area. Excellent value and a short stroll from the bars & restaurants of lovely Cascais. Centrally located right next to the Marina in Vilamoura, the Hotel Vila Gale Marina is a firm favourite offering great value holidays for golf groups, couples and families alike. This popular hotel in the picturesque and busy fishing village of Alvor offers a great value 'ALL INCLUSIVE' option in the Western Algarve. With breakfast, lunch, and dinner buffet, as well as snacks and ice-cream, drinks and entertainment included, the hotel is ideal for those who want to spend their holidays in Algarve without a care in the world. Combined with great discounted golf packages on your choice of 5 Pestana owned courses this hotel really does offer terrific value! 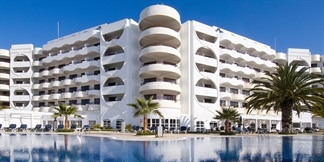 Close to Albufeira, the stylish 'All Inclusive' NAU Sao Rafael Suites offer great value for money and is ideal for groups. Golf is offered over a choice of 3 great courses at Salgados, Morgado & Alamos, with a free shuttle offered to each. Within a few yards of the Marina at Vilamoura, the Dom Pedro Marina has a great location and offers excellent year round value for groups and couples. In Vilamoura next to the beach, close the marina and with Vilamoura's golf courses all within a few minutes of the hotel, the Vila Gale Ampalius is a great choice for golfing groups and couples. In the delightful fishing town of Tavira with easy access to Benamor, Quinta de Ria & Quinta de Cima, the Vila Gale Tavira offers great a value for couples & groups. In Vilamoura with the marina on one side and the beach on the other, the Tivoli Marina has a great position and is a firm favourite offering a good base for golfers and non golfers alike. With a peaceful location right on the marina in Portimao overlooking the River Arade. If it is lots of nightlife on your doorstep as well as great golf that you are after on your golfing holiday, then the great value Hotel Cerro Alagoa, located near to the centre of Albufeira could be just for you. Soak up the atmosphere of historic Lagos and enjoy some great courses on the Western Algarve. This hotel has a great location in the town itself and close to the marina whith its wealth of restaurants and bars. Lagos is within easy driving distance of some great courses, including Palmres, Boavista, Morgado & Alamos and the great new course at Espiche. A cliff-top location within an easy walk of the bars & restaurants in Carvoeiro and close to the Pinta & Gramacho courses. Excellent value!